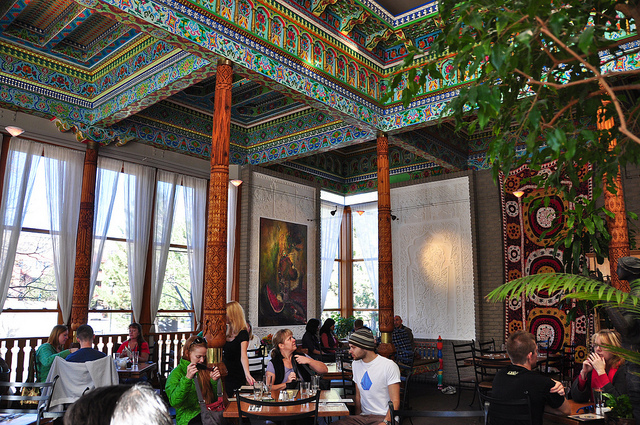 The handcrafted Boulder Dushanbe Teahouse was a gift from Dushanbe, Tajikistan, one of Boulder’s seven Sister Cities. It arrived in pieces inside more than 200 crates, which were stored for years while the Boulder citizen’s group searched for a location and raised money to assemble the complex puzzle. Eventually, the city of Boulder offered a downtown site. Tajik craftsmen in baggy trousers and embroidered jackets worked side-by-side with local crews to put it together. The Tajiks’ intent was that the teahouse be used as a community gathering place, as it would be in Tajikistan. It opened in 1998 and is the only teahouse of its kind in the Western Hemisphere. A restaurant added to the traditional teahouse offers a variety of dishes from around the world, and serves breakfast, lunch and dinner and a traditional English afternoon tea (reservations required 24 hours in advance). In addition, the teahouse hosts an annual Rocky Mountain Tea Festival with tea tastings and lectures on topics like cooking with tea, natural healing and reading tea leaves. In exchange for the gift, Boulder residents chipped in to build an Internet café in Dushanbe.